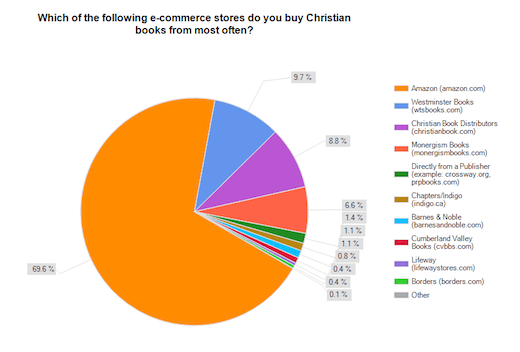 Last week I found myself thinking about how and why and where we all buy our Christian books. I started with the question, “Why do people shop at one e-commerce store and not another.” And from there I just found more and more questions that were begging for answers. 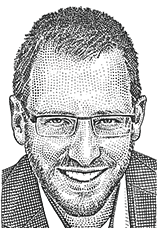 Before I long I had put together a survey and asked if you, the readers of this site, would like to fill it out. In the end I got 2,222 responses (how’s that for a cool number?). And I thought it would be fun to share the results since, well, they are really your results. The majority of those who filled out the survey were male (about 70%) and just over 80% were American. I asked those questions simply for sake of context. 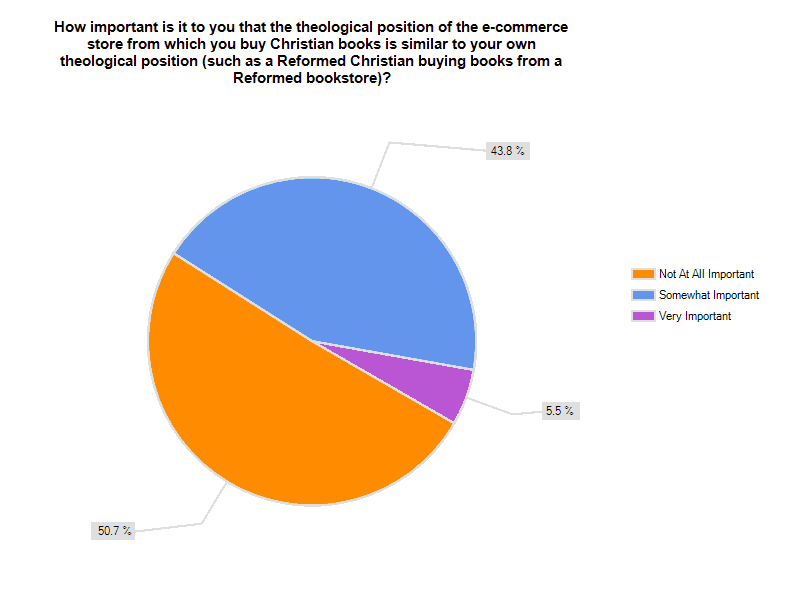 I also asked whether respondents consider themselves Calvinist or Reformed. A couple of people criticized that question so let me explain myself briefly. I asked it simply because I wanted to know specifically where this “Young, Restless, Reformed” crowd is doing their shopping. 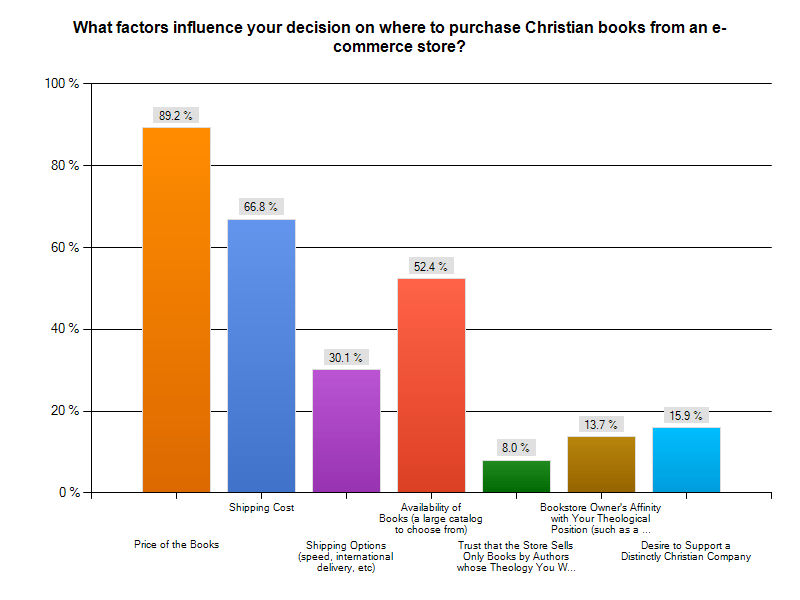 We all know that the new Calvinism is both generating and consuming vast amounts of books and I was interested in knowing which stores were the beneficiaries. 89% of those who responded defined themselves as Reformed and 83% as baptistic. 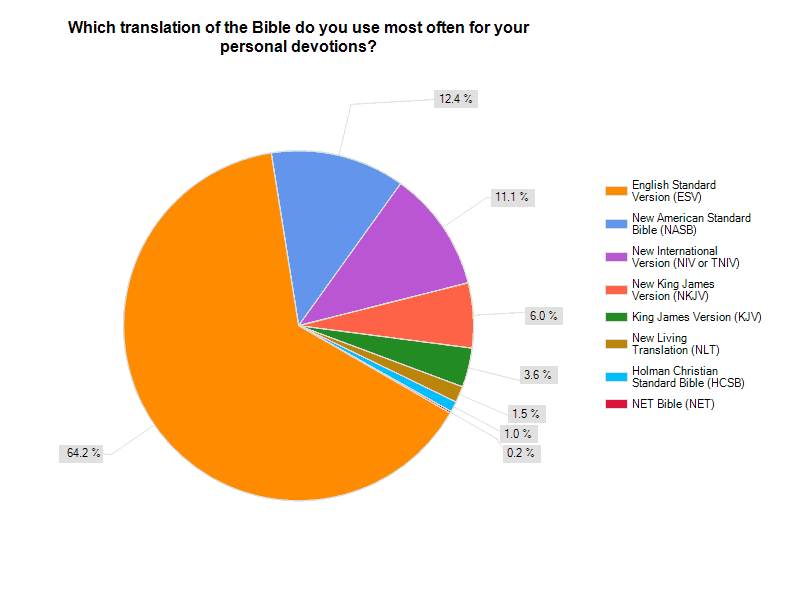 In a question I asked kind of on a whim (since it’s not entirely relevant to the topic at-hand), I found that 64% use the ESV as their preferred Bible translation. I suppose this solidifies my assumption that the ESV is the Bible translation of choice for all of these new Calvinists. 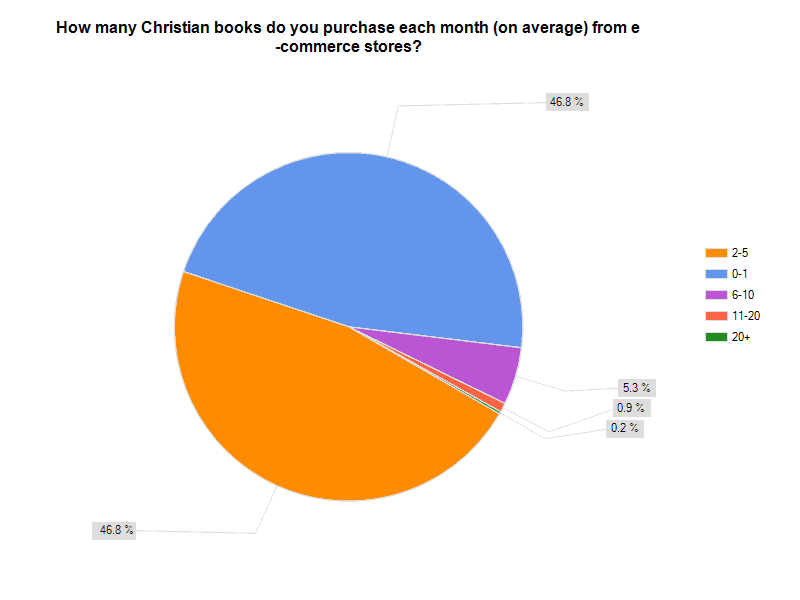 In terms of book sales, over 50% of respondents purchase 2 or more books per month, on average, from an e-commerce store. 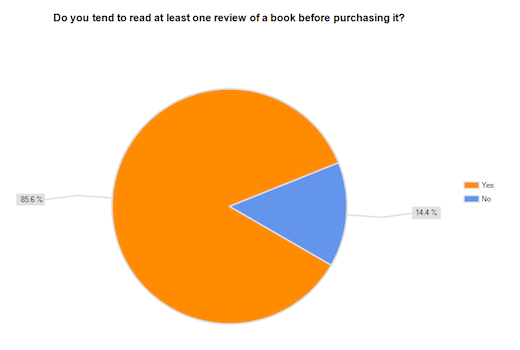 The next question dealt with book reviews and almost 86% claim that they read at least one review of a book before purchasing it. There’s one publishers and booksellers will want to note, I’m sure. People are reading reviews! In a future survey I may ask more about where people find their reviews. 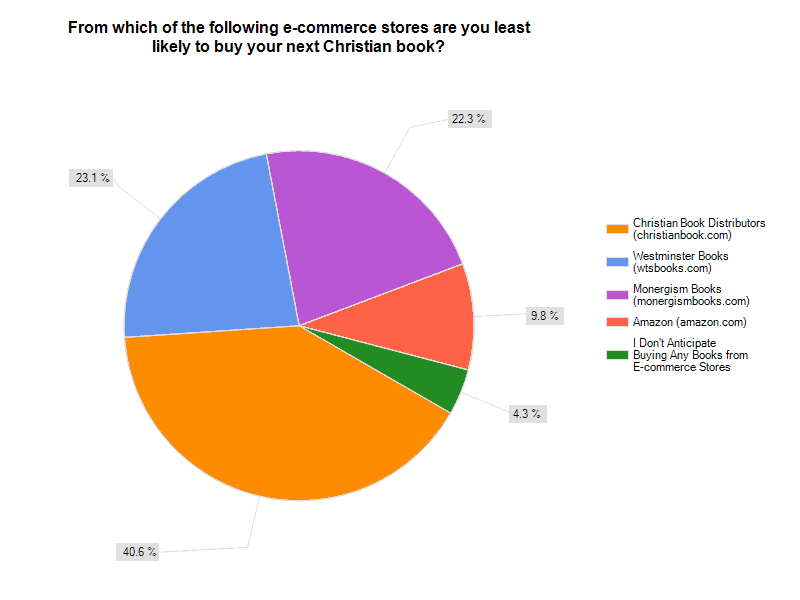 Though I was not surprised to see Amazon dominating here, I was somewhat surprised to see the full measure of its dominance with over 92% saying that they have purchased Christian books from Amazon in the past 24 months. 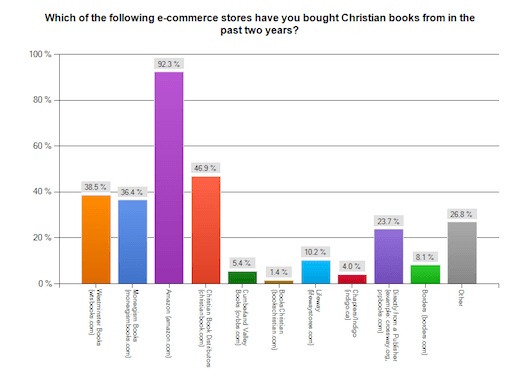 Christian Book Distributors (CBD) showed quite a bit of strength here, perhaps because of the heavily-discounted theological sets they are known for. Westminster Books and Monergism Books also fared very well. 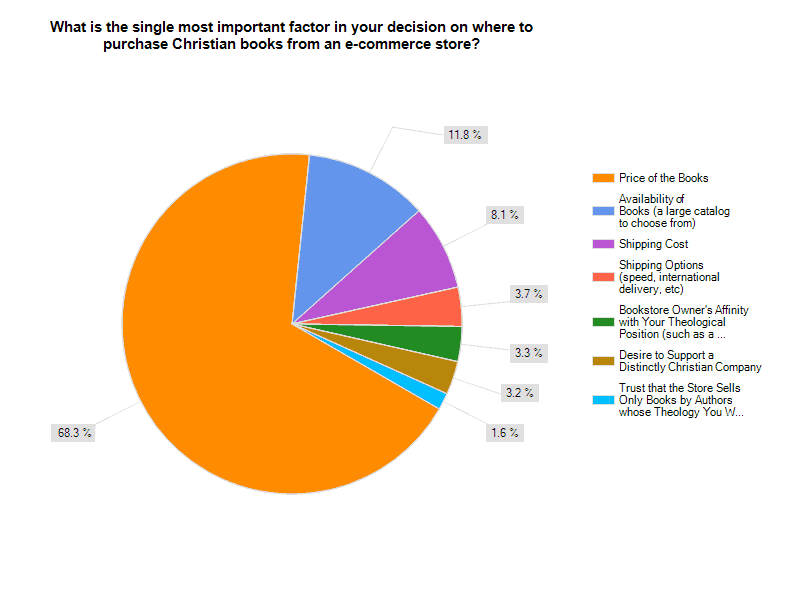 In the next question, I provided the same list of stores and asked where the respondents buy their books most often, allowing them to select only one option. Here Amazon continued its dominance, claiming almost 70%. But Amazon’s dominance was to continue. In the third question in this vein I asked the all-important “From which of the following e-commerce stores are you most likely to buy your next Christian book?” Once again Amazon rose to the top and in dominating fashion with 5x more people likely to buy their book there than at the next closest competitor. 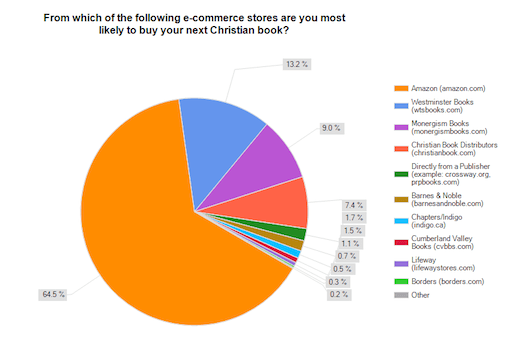 Turning the question around, I reduced the list to a few of the more popular stores and asked where people are least likely to buy their next Christian book. Here CBD was the most popular option (though in this case most popular is actually least popular). Amazon once again led the way. I am not quite sure how to account for CBD ranking well in the first question, meaning that plenty of people have purchased books there, but relatively poorly in the rest, meaning that people are not likely to buy there again in the near future. All I can guess is that people have used CBD in the past but, for one reason or another, have since found a preferred alternative. Or maybe people shop at CBD only when they can take advantage of a special. 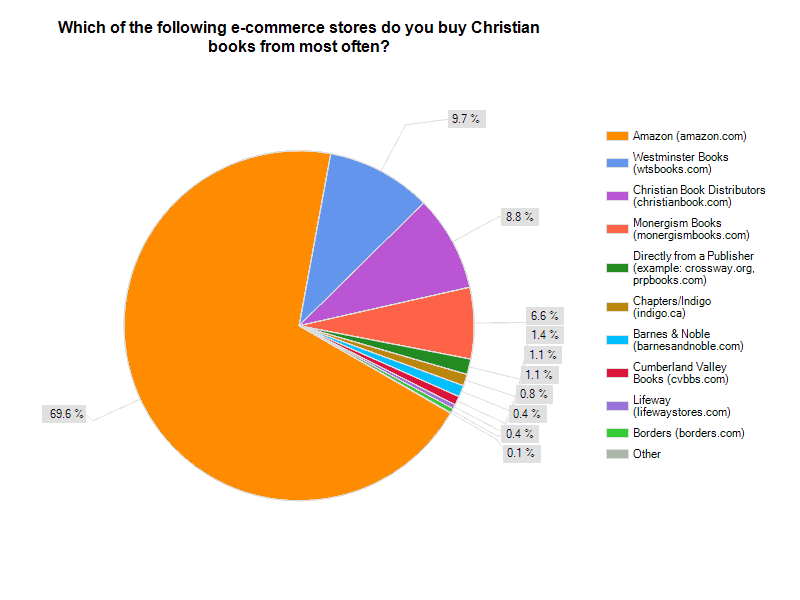 When we look at the facts so far we learn that all of these new Calvinists are certainly buying lots of books and are doing so largely at Amazon. Though other stores maintain some level of popularity, Amazon is clearly dominating. Now let’s try to understand why. 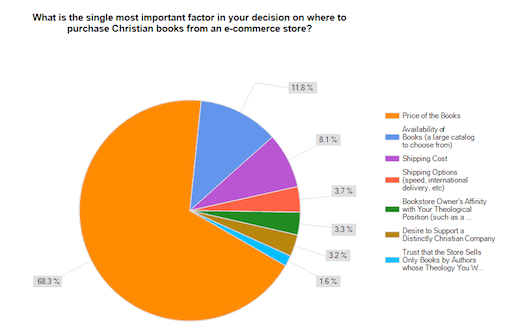 I asked “What factors influence your decision on where to purchase Christian books from an e-commerce store?” and offered a list of potential reasons, some practical and some theological. 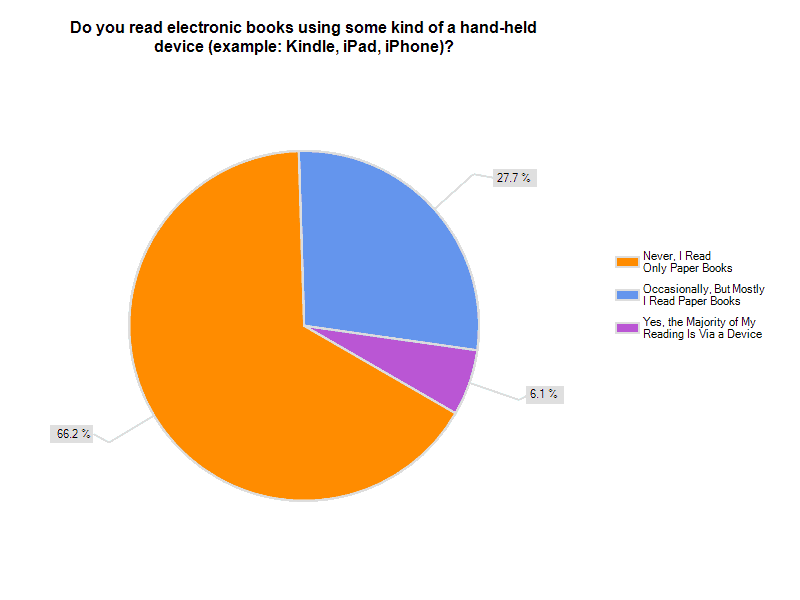 For this first question, respondents were allowed to choose as many as they wanted. I was not surprised to see what price was the single most important factor. This will go a long way to explaining why Amazon dominates; people will shop where the prices are good or where there is the perception that they are getting the best prices (since, in reality, stores like Monergism Books and Westminster routinely offer better prices). Shipping cost and shipping options are also important factors, especially for international buyers. I was rather surprised to see the three lowest results–that respondents were not too concerned about the theology of the store they buy from and were not too concerned if there is a mix of good books and bad in the catalog. The important factors are price and convenience. For the next question I offered the same list of factors but allowed respondents to select only one, asking them to choose the single most important factor in deciding where to shop. Once more price rose to the top and by a very significant margin. A large catalog is important as is the cost of shipping, but ultimately we want our books to be inexpensive. We will shop where the bargains are or where we think the bargains are. I was quite surprised by this result. I had expected to see less dominance from Amazon in the previous questions and more of a presence from the distinctly Reformed bookstores. But the results of this question are consistent with what we saw in the several before it. Price matters far more than the desire to shop in a “safe” place. 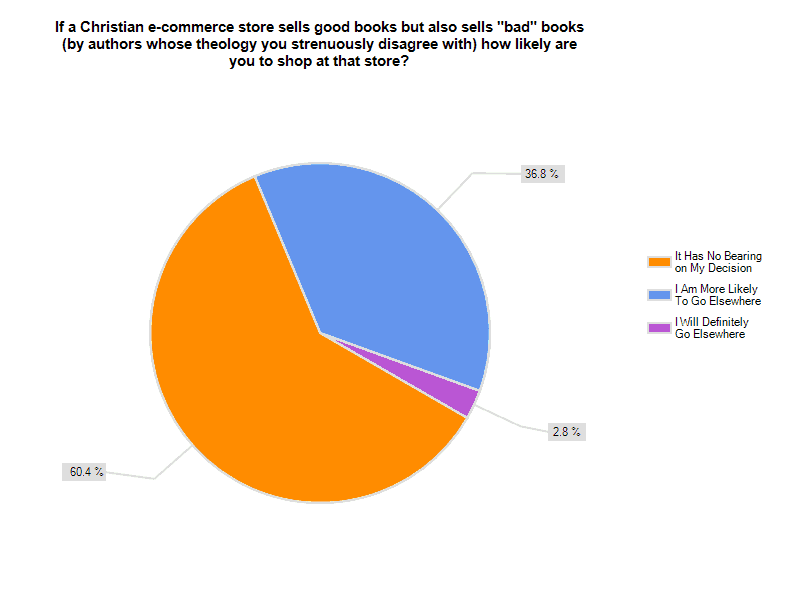 Next I tested team loyalty asking “How important is it to you that the theological position of the e-commerce store from which you buy Christian books is similar to your own theological position (such as a Reformed Christian buying books from a Reformed bookstore)?” Assuming that most of my respondents were Reformed, and assuming that many of them shop at places like Monergism Books or Westminster Books, I wanted to know what it was that drove them to such stores. Though there does seem to be some sense of team loyalty, where people will buy from those who are like-minded, in the end it seems that price is more important. Having asked about where and why people shop, I thought it would be interesting to know what publishers we trust the most and asked “Which publishers have particularly high credibility in your mind?” Now I received a lot of negative feedback about this question because initially I required 3 responses–no more, no less–and many people said that they really do not know one publisher from another; they know authors, not publishers. After a short time I removed that limitation. So I’ll grant that the results may be a bit skewed. Having said that, I saw no real difference in the first set of results (before I removed the limitation) and the subsequent set. Zondervan fared very poorly here with Thomas Nelson and Intervarsity behind it. 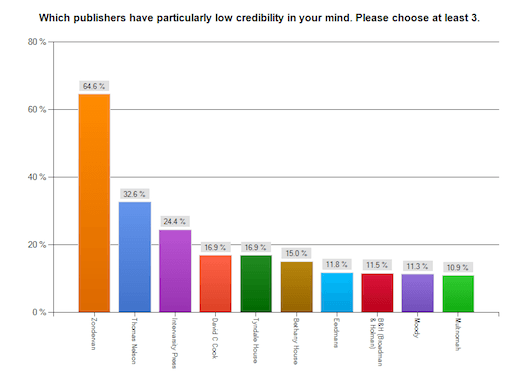 I am going to go out on a limb and say that David C. Cook’s 16.9% result owes to people who did not know one publisher from another so chose one they had not heard of before. I could be wrong, of course, but that one seems strangely out of place (how many people can name a single book published by Cook?). 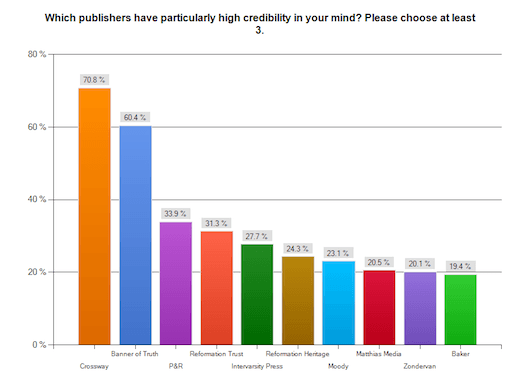 There is a strange irony in Zondervan, the publisher for which I am writing a book, being least credible. I’m sure this owes largely to their past committment to the books of the Emerging Church. Finally, I asked just a couple of questions about electronic reading, asking how many people read using some kind of an electronic device. 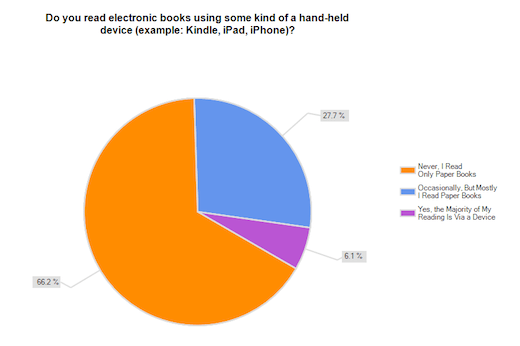 The first question was “Do you read electronic books using some kind of a hand-held device (example: Kindle, iPad, iPhone)?” The results showed that, at least to this point, electronic books still have only a relatively small hold on the market. The percentage is not insignificant, but neither is it as large as I may have thought. It will be interesting to measure that in a year or so once the iPad has established itself, to see if it draws more people in. Then again, in the final question I asked “Compared to the past twelve months, how much reading do you expect to do on some kind of an electronic device in the next twelve months?” and the percentage who intend to start reading electronically is still not that strong. 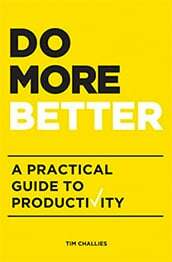 It seems that those who are committed to e-reading will continue to do so and those committed to paper will largely stick with paper. Overall, I was a bit surprised by some of the results of this survey and not at all surprised by others. I’ll admit that I am largely an Amazon shopper but have attributed it to the fact that I’m on the other side of the border and Amazon is the most reasonably-priced option. 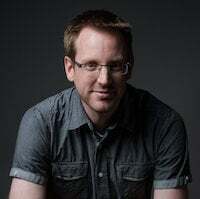 When I consider buying books, I largely choose on the basis of shipping–who will ship to Canada in the first place and who will do so at a reasonable rate. I think that if I lived in the US I would be likely to buy from a distinctly Christian store. But perhaps not. The benefit of Amazon, even more than its prices, is its sheer convenience. While you are buying your books, you can also order a couple of DVDs, a new GPS and a few groceries. My survey couldn’t measure exactly why people go to Amazon, but I suspect that is one of the most important factors. And that is that. Being neither a statistician nor the son of a statistician I do not know what else to do with the results. I could try all kinds of fancy filtering and funneling but I don’t know how much that would benefit us. 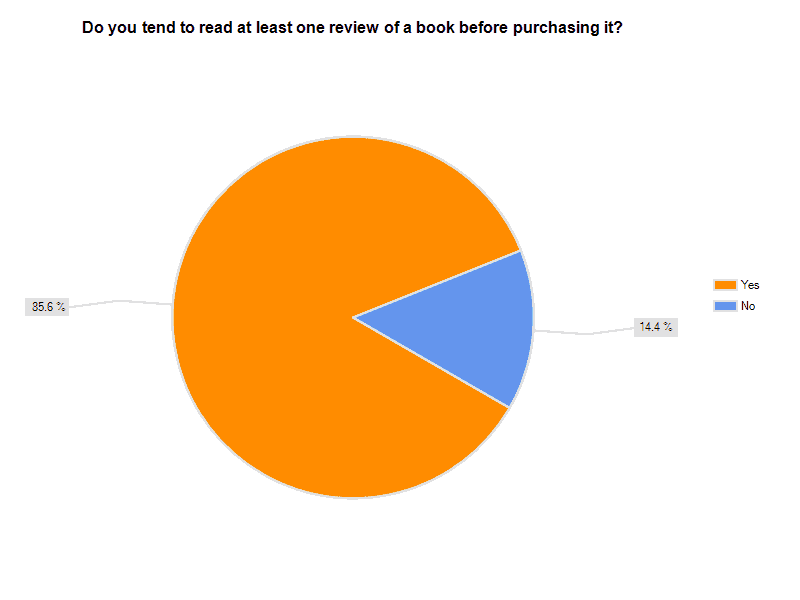 If you are a bookseller or publisher and would like more detailed results, I’d be glad to try to help you out. Feel free to shoot me an email and I’ll see what I can do. And for everyone else, do let me know if you enjoyed this survey and its results. I’m always looking for new ideas to add value to the blog and am glad to do future surveys if you find them valuable or interesting. And if anyone has another idea for a survey (not necessarily related to books or shopping), feel free to leave a comment or send me an email. I’ve paid for a month of the service and may as well take advantage!